LAPD Open House and Pancake Breakfast is September 7th! - Yo! Venice! Home Venice Beach Events Kids Events LAPD Open House and Pancake Breakfast is September 7th! 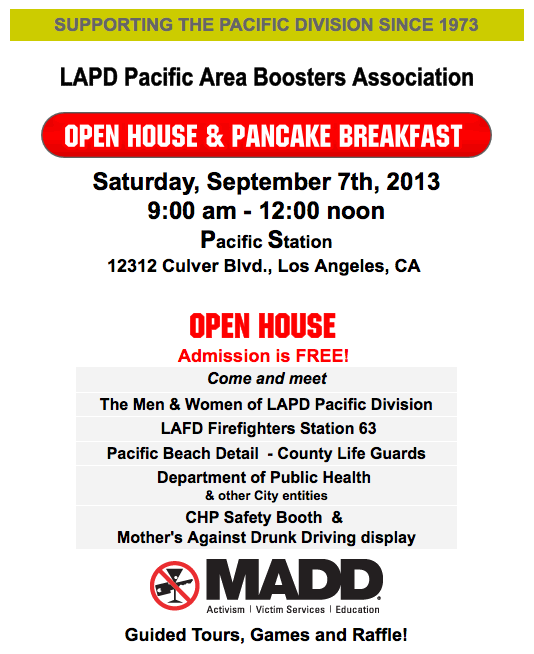 LAPD Open House and Pancake Breakfast is September 7th! The LAPD Pacific Area Boosters Association will host their pancake breakfast and open house this year on Saturday, September 7th, from 9 am – 12 noon at the LAPD Pacific Station. If you would like to discuss crime in Venice with an LAPD officer, this would be a good time to do it! The open house and activities are FREE! Residents are encouraged to come and meet the men and women of LAPD Pacific Division; Pacific Beach Detail; LAFD Firefighters Station 63; County Life Guards; Department of Public Health and other City entities. LAPD Specialized Units and ATV’s will be present. CHP Safety Booth and Mothers Against Drunk Driving will have displays. There will be guided tours, games and raffle prizes! Proceeds from the pancake breakfast will benefit the Pacific Area Boosters Association, so bring a big appetite! Breakfast will be $5.00 per person at the event, or you can pay online by clicking here! For more information please contact Pacific Area Community Relations Office at 310.202.2890.